Hi! Glad you stopped by! Your support and encouragement make this adventure possible -- Thank you! Warm up song: Hall and Oates "You Make My Dreams Come True"
After competition indulgence: Burger and chocolate milk shake! A unique quality off the track is my unwavering curiosity. It seems like my mind constantly begs for the exercise I offer the rest of my body. I love Ted Talks, crossword puzzles, brain teasers, word scrambles, etc. and complete some kind of mentally engaging activity daily. Furthermore, I worked for a year with the FDA in a polysaccharide lab, and completed my senior thesis in the Princeton Neuroscience Institute. I have recently garnered an interest in psychology after beginning to tutor students preparing for the SAT/ACT. Tailoring information and motivation for each student keeps teaching the same material challenging and interesting. RT @njnytc: What was the performance of the weekend for the squad? Born and raised in southern New Hampshire, Cecilia attended Bishop Guertin High School. 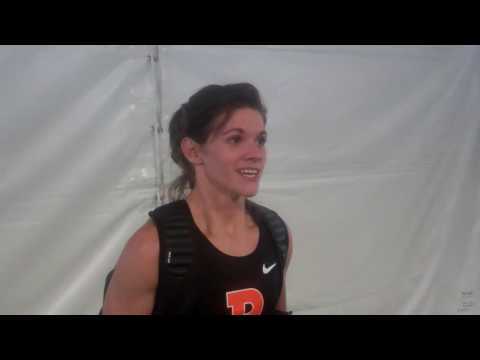 After a successful high school campaign, in which she tallied five New Hampshire State Championships, Cecilia joined the Tigers of Princeton University, where she would not only earn a degree in Molecular Biology, but also set 11 school records and bring home multiple Ivy League Championships and All-American honors. Cecilia would cap off her stellar career with with a fifth place NCAA finish in the 800 meters. In her first major competition following graduation, she earned a spot in the semi-finals at the 2016 Olympic Trials. On the training days, Cecilia has an affinity for workouts, stating, "I live for solid speed work after an endurance workout, or better yet some race-pace-quality-time-trial training. Even at practice I can work up a little extra adrenaline to get through tough intervals." Off the track, Cecilia has a healthy obsession with food, saying, "I love to bake, cook, use new cooking techniques, watch cooking shows, narrate my life as if I am on a cooking show...I'm happy to have a roommate now who is always keen to share in the harvest!" In the remainder of her free time, she can regularly be found playing games, "Whether it's poker with my brothers, Code Names, or Catan, I'm always down to play. Just know my competitive edge is not reserved for track events!" Coming from a large family sparked Cecilia in numerous ways, many of which she continues to see, noting, "Growing up with my seven siblings indelibly shaped me in countless ways for which I am forever grateful. Not only do I have my older siblings to thank for the benefits of some quite literal sled-pulls in my youth, but I've come to realize and appreciate the unequivocal strength gained from all of their support." After her time on the oval is complete, Cecilia hopes to continue on with a career in research.